For our first years of schooling, I used a curriculum that used unit studies for most of the instruction. I really loved the kindergarten and first grade programs. There were many fun and exciting activities to do. We really enjoyed it for those years. But there were some things in the curriculum that I did not agree with, and as the years went by, this was increasing. The curriculum was also so hands-on, that if I was not available to help my children, they simply could not do school. I am not saying that this curriculum was all wrong or couldn't work for anyone. It just wasn't working for us. So last year I sold all of it and purchased new curriculum. The children and I have been enjoying it ever since. And I can be assured that life's interruptions will not keep us from getting school done. For spelling, we will be using Rod and Staff. The Bible references throughout are a wonderful encouragement. We will be using Rod and Staff readers for reading. The children really enjoy these. I am using Christ Centered Curriculum for phonics. I also plan to teach some of the older children piano with some of the books I used when I learned many years ago. They are very excited about this. I plan to use Home Economics for Home Schoolers with our girls who are old enough. It is a delightful book from Pearables that teaches homemaking skills to young girls. There are also more books in the series that I hope to get some day. There are more books for girls that I would like to incorporate if there is enough time, like Keepers at Home: A Handbook for Young Ladies , Polished Cornerstones and Beautiful Girlhood . I am so thankful that I am blessed to teach our children at home. I can be with them all day helping them learn more about the Lord while they study about His world. Oh, what a blessed occupation! 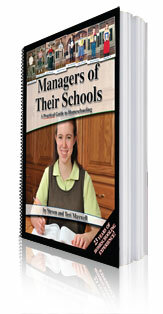 Managers of Their Schools by Steve and Teri Maxwell. This book helps you with great insight in teaching your children and helps you get organized in your homeschool. It's great to have a curriculum that you love! We have been using "My Father's World" for 4 years now and think it's awesome!!! Oh yes, that is quite a blessing! We're using several of the same materials. I have been so blessed by all of the Maxwells' books through the years. Even though there are things I appreciate about other methods (there's so much I like about Charlotte Mason's ideas, for example), there are also things that I don't agree with and don't follow. And there are so many things I just don't have time or resources for. The Maxwells' plan makes so much sense. This year and last year I purchased Apologia for science because I really like the idea of it and the immersion method of teaching science makes so much sense. But with five children of varying ages and stages, I'm (again) finding that it's hard to get it all done. My oldest (age 12) asked me to just let her do Abeka for science this year. She likes the books and enjoys reading them. I'm thinking next year about just having the other children use Abeka as well. I just find it difficult to teach them all together most of the time (especially with adding a two-year-old into the mix!). May you be blessed as you serve your family! Oh I agree--the Maxwell's books have been a tremendous blessing to me too! I understand about Charlotte Mason's method--I feel the same way. That is wonderful to hear your daughter at 12 still enjoys her science. This is our first year using Abeka and I have been pleased so far.